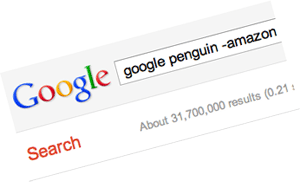 Home > Google News > Google SEO > Hit By Penguin? Google Query Hack To Confirm? Here is one more crazy thing for the Penguin Igloo - a search hack that may show you if you were hit by the Penguin update! The news came from a WebmasterWorld thread this morning by a Junior Member who was hit by Penguin codenamed Martin Ice Web. He said that when he was searching for his keywords and added a negative parameter for amazon, his rankings went back to normal. For example, he search for [blue widget -amazon] and his rankings pre-Penguin showed up on Google for the query [blue widget]. I tried this myself on a ton of examples of sites that were hit in the forums and I was unable to replicate it to the extreme but it does kind of work. For example, a Google Webmaster Help thread has the owner of discounted-hotels-london.co.uk saying that [strand palace hotel -amazon.com] brings up his site on page one. I see it on page two with that query but on page 27 for [strand palace hotel] without the -amazon. I tried it on some others but failed. Give it a try on your end and let me know if it works. This seems so weird. Although there was a time years ago where we had a weird hack like this before. Remember the Google Sandbox, there was a query hack for that to where you would put -dfsdgsdsd -sdfgsdgsdfg -sdfgsdgsdg -sdfgsdfgsdfg -dsfgsdgsdg -sdfgsdfgsdfg -sdgsdfgdsfg at the end of the query and it would show pre-sandbox results. Update: This stopped working around May 24, 2012. This was 100% a hack to see pre-Penguin results. 100%.